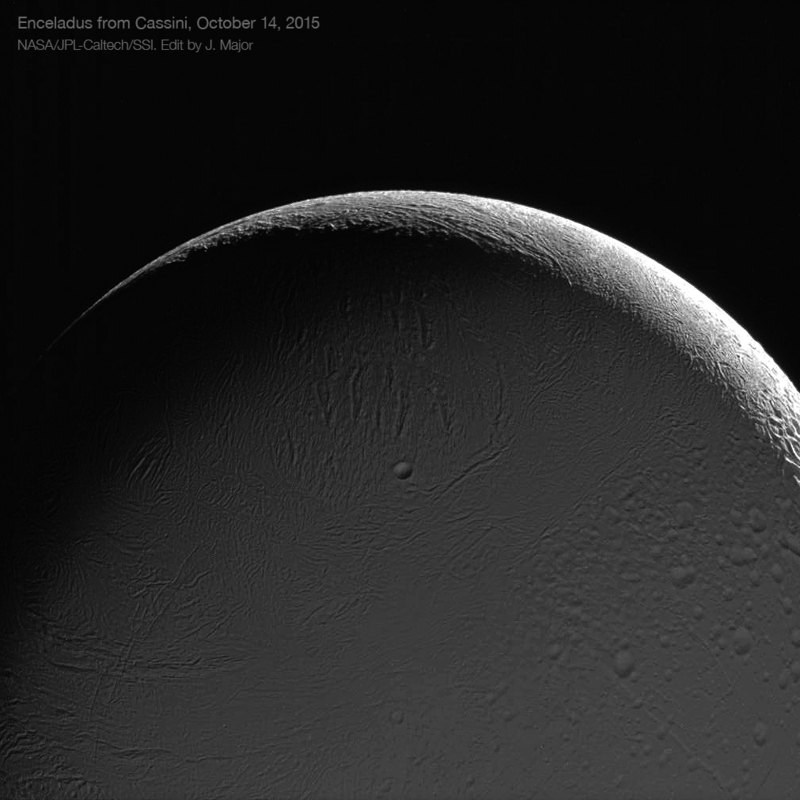 A view of the Saturn-lit night side of Enceladus from Oct. 14, 2015. On Wednesday, Oct. 14 2015, Cassini performed its scheduled “E-20” close pass of Enceladus, a 320-mile-wide moon of Saturn that is now famous for the organics-laden ice geysers that fire from cracks in its southern crust. E-20 is the first of a series of three flybys to be performed before the end of 2015, specifically timed to give the spacecraft a good view of Enceladus’ north polar region now that Saturn is moving into its summer season. 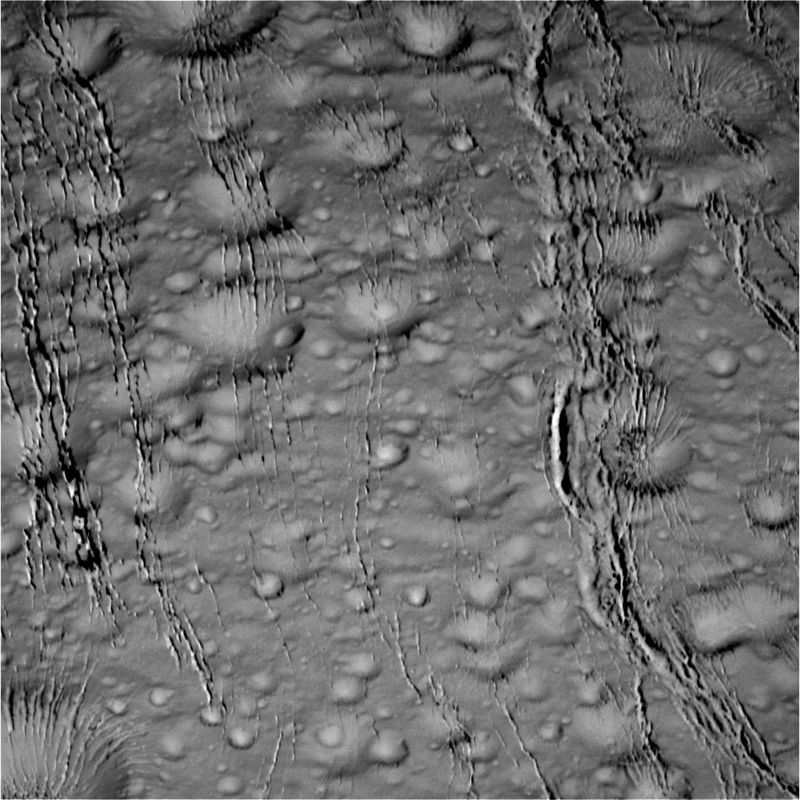 The raw image data from E-20 has just arrived on Earth today (which, by the way, is the 18th anniversary of Cassini’s launch!) and I particularly liked the one above. Crescent-lit by the Sun, Enceladus’ night side is seen bathed in the dimmer glow of reflected light off Saturn and its rings. Dead-center is the 6.5-mile-wide crater Bahman, surrounded by a wrinkly field of cracks and troughs in the moon’s highly-reflective icy surface. Recent findings from the Cassini mission have confirmed the presence of a subsurface ocean sandwiched between its icy crust and rocky core — not pockets of water trapped in ice, not a localized southern reservoir, but a full global ocean similar to Europa’s and Ganymede’s! Cassini’s next flyby of Enceladus on Oct. 28 will send it directly through the moon’s plumes, where it can closely investigate their composition. See the original raw image as it was acquired here, and for more intriguing images from the E-20 flyby check out Nancy Atkinson’s article on Universe Today and on the CICLOPS imaging team’s website here. Image credit: NASA/JPL-Caltech/SSI. Edited by Jason Major.